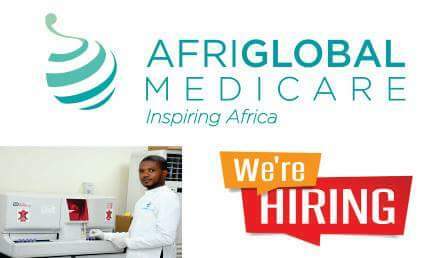 Afriglobal Medicare Limited is currently recruiting Medical Laboratory Scientists for the expansion and development at her new branch in Ekiti State, Ado Ekiti. Afriglobal Medicare Limited is a world class medical diagnostics facility at ikeja Lagos, offering comprehensive yet affordable testing services. Must be a resident in Ekiti state, most preferably Ado Ekiti resident. Application Ends on 4th February 2018. Stay updated, SUBSCRIBE to our newsletter, follow on TWITTER as well as like our FACEBOOK page.